…has so far been weighted more towards trashy than classy. Trashy has included Deryni Rising, by Katherine Kurtz, who is a name I’ve seen a lot, as a fan of fantasy, but have never read. It’s high fantasy in western medieval setting. A first novel (though written and published before I was born) and it shows. Characters are thinly sketched, but the potential is there. The entire novel takes place in a small geographic area and at least half of it takes place over thirty-six hours or so, which I as good sign – an attempt to do something a little different, as well as something focused on internal politics. That said, still needed some ‘seasoning.’ Also, there were characters known merely as ‘Moors’ who all work for bad guys and get exactly zero additional characterization, which I would suggest is borderline racist, if it weren’t so obviously fully racist. Michael Moorcock has earned some literary cred, but he also wrote a lot of trash. Fun trash, but trash. Of his interlocking, slightly revisionist, high fantasy novels, the original Elric stories are, without doubt, the best. And the novels of Dorian Hawkmoon are, beyond a doubt, among the worst. Which makes the number of times I have read those novels inexplicable. And makes reading the original tetralogy again, during my holiday, incomprehensible. Hawkmoon, as a character, is boring (though on his companions, Huillam D’Averc, is, if thinly drawn, at least interesting and fun), the post-apocalyptic world of science and sorcery is not nearly as clever nor as relevant as Moorcock clearly believes. 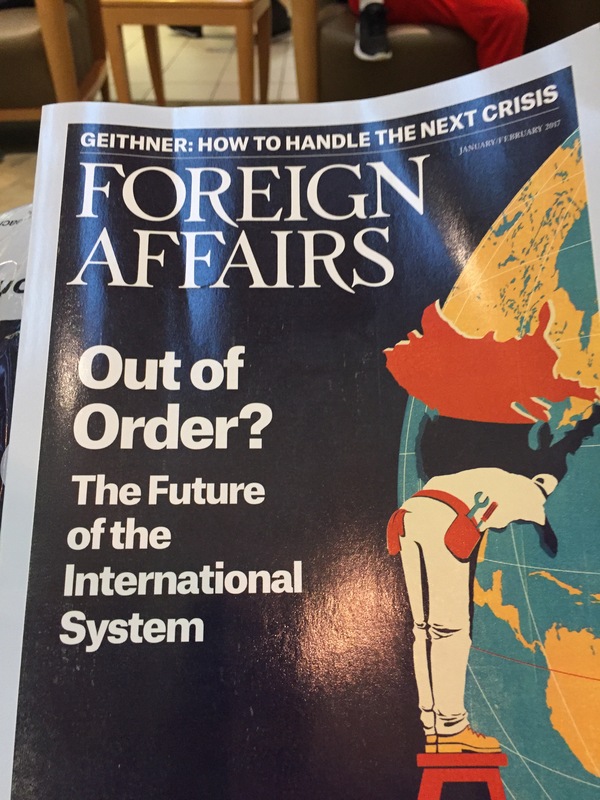 But, at least I read the latest edition of Foreign Affairs. Too bad it was about how Trump is going to blow up the liberal order of progress and justice-based structures. So, um… yay! I read something worthwhile!